It’s reality-check time for the Golden State Warriors and the bettors who put money on the team to break a major record. Stephen Curry is not in Michael Jordan’s airspace yet, and he’s probably not getting there this season. Jeff Sherman, the main NBA oddsmaker at the Westgate Las Vegas sports book, said the Warriors have “no chance” to reach 73 wins. Golden State’s undefeated run to open the season inspired Sherman to post a proposition in late November: Will the Warriors win 73 or more regular-season games? The “No” side opened at minus-700 with “Yes” at plus-500. The Warriors reached 24-0 before a loss at Milwaukee on Dec. 12. The “No” side of the Westgate prop price dropped as low as minus-125. But the prop was taken off the board Sunday. A funny thing happened. Golden State lost its past two road games — at Denver and Detroit — to fall to 37-4. The Warriors are 3-point underdogs at Cleveland tonight, and they play at Chicago on Wednesday. 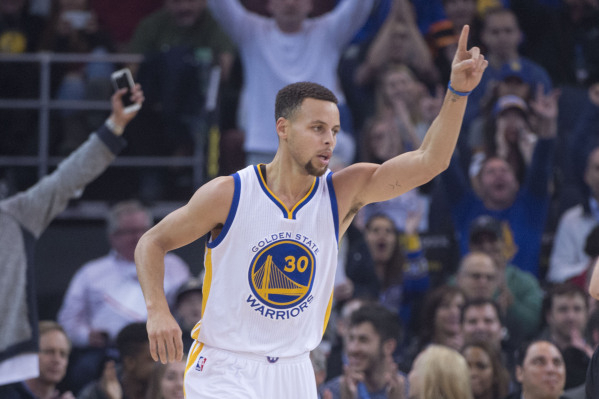 Golden State faces a seven-game road trip in February and games at San Antonio on March 19 and April 10. The Spurs are 36-6, including 24-0 at home. The Jordan-led Chicago Bulls finished 72-10 in 1995-96. No other team ever has won 70 games. Golden State went 67-15 last season en route to winning the NBA title.